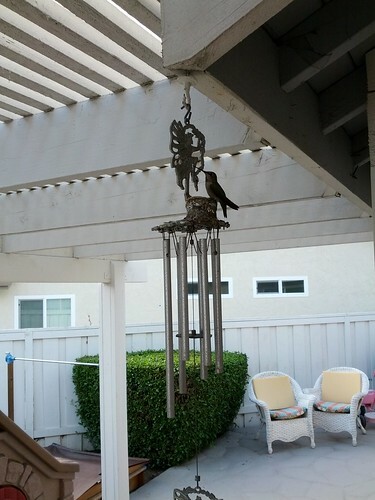 A lot of you are probably aware that we have had a hummingbird nesting on our wind chime every Spring for the last few years. If you weren’t aware of this, I hope you feel the proper amount of shame at your ignorance, but you can know feel better knowing that you’ve joined the blessed, informed masses. Yes, they eggshells do seem to be taking up an inordinate amount of space. The hummingbirds need to get used to being tiny at an early age. However, this post isn’t about adorable hummingbirds. 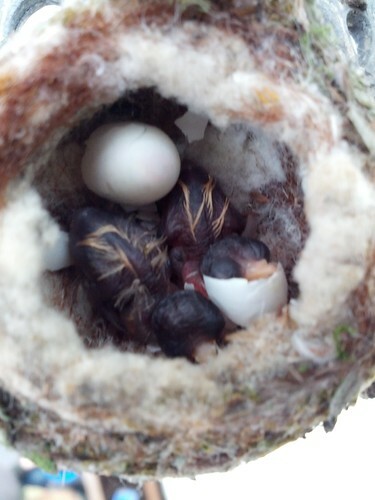 It’s about crazed hummingbird mothers. Last night, I heard a buzzing and soft tweet noise coming from the kitchen. Being a parent, I assumed that one of my children’s toys was stuck under something, so I went to go rectify the situation. I was not prepared to find the mother hummingbird, apparently enraged by the miracle of electric lighting, attacking the ceiling fixture in my kitchen. How does a hummingbird end up in you kitchen in the middle of the night? 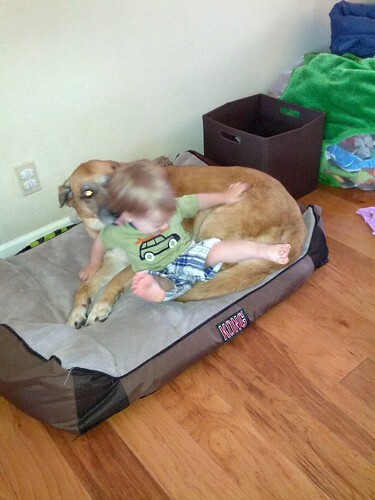 We would later determine that the screen on the sliding door had been opened by the source of almost all our problems: the dog, shown here viciously allowing Gabe to fall on her. 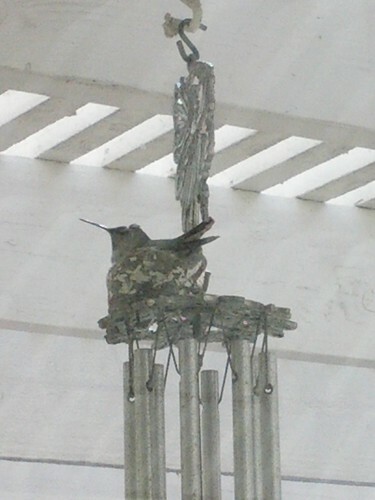 Regardless of the cause, I had to get the hummingbird out of the kitchen before she ended up knocking herself senseless. Since she was going after the light, I turned off every light in the kitchen and threw open the sliding door as wide as I could. Unfortunately, I didn’t turn off every light in the living room. So next, I followed the hummingbird into the living room, where she was bashing herself against the ceiling. I opened the sliding door there and switched off all the lights in the living room, hoping she’d be drawn out by the light I’d turned on in the back yard. Unfortunately, I didn’t turn off every light upstairs. So now I’m in the top of the stairwell, with one sleeping child and one child in the process of bedtime only a door away, and a increasingly crazed bird crashing into the walls. So naturally, I herded the hummingbird into my bedroom. I should stress that hummingbird herding is much more of an art than a science, and as an artist, I’m at the stick figure, coloring outside the lines level. At one point, I tried, unsuccessfully, to catch her in a tissue box. Jessica became involved at some point here and we opened both bedroom windows, turned off the lights and, in the dark, tried to usher the tiny, frantic bird out of our house. We had her near the windows when the buzzing of her wings just stopped. We turned back on the lights and searched the room, but neither of us could find her. I actually searched the room three times, convinced she’d be hiding under the bed or caught up in the curtains. Since neither of us was sure if she’d gotten out, we slept with the windows open, hoping she’d find her way out if she hadn’t already. So she looks like she went on a bit of a bender last night, but considering how many walls and windows and light fixtures she headbutted yesterday, if all she has to show for it is a punk rock haircut, I think we can call that a win. Oh my. Poor you. Wait, no… Poor hummingbird!! !